Dynamic Host Configuration Protocol (DHCP) is a network protocol that enables a server to automatically assign an IP address to a computer from a defined range of numbers (i.e., a scope) configured for a given network. 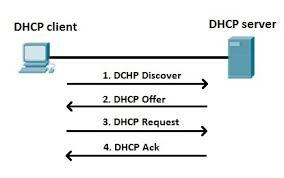 What is the dhcp process for client machine? 1. A user turns on a computer with a DHCP client. 2. The client computer sends a broadcast request (called a DISCOVER or DHCPDISCOVER), looking for a DHCP server to answer. 3. The router directs the DISCOVER packet to the correct DHCP server. 4. The server receives the DISCOVER packet. Based on availability and usage policies set on the server, the server determines an appropriate address (if any) to give to the client. The server then temporarily reserves that address for the client and sends back to the client an OFFER (or DHCPOFFER) packet, with that address information. The server also configures the client's DNS servers, WINS servers, NTP servers, and sometimes other services as well. 5. The client sends a REQUEST (or DHCPREQUEST) packet, letting the server know that it intends to use the address. 6. The server sends an ACK (or DHCPACK) packet, confirming that the client has been given a lease on the address for a server-specified period of time. DHCP scopes are used to define ranges of addresses from which a DHCP server can assign IP addresses to clients. Types of scopes in windows dhcp ? Normal Scope - Allows A, B and C Class IP address ranges to be specified including subnet masks, exclusions and reservations. Each normal scope defined must exist within its own subnet. Multicast Scope - Used to assign IP address ranges for Class D networks. Multicast scopes do not have subnet masks, reservation or other TCP/IP options. Multicast scope address ranges require that a Time To Live (TTL) value be specified (essentially the number of routers a packet can pass through on the way to its destination). Superscope - Essentially a collection of scopes grouped together such that they can be enabled and disabled as a single entity. What is Authorizing DHCP Servers in Active Directory? If a DHCP server is to operate within an Active Directory domain (and is not running on a domain controller) it must first be authorized. This can be achieved either as part of the DHCP Server role installation, or subsequently using either DHCP console or at the command prompt using the netsh tool. In the above command syntax, serverID is replaced by the IP address or full UNC name of system on which the DHCP server is installed. What ports are used by DHCP and the DHCP clients ? Requests are on UDP port 68, Server replies on UDP 67 . Safe and reliable configuration. DHCP avoids configuration errors caused by the need to manually type in values at each computer. Also, DHCP helps prevent address conflicts caused by a previously assigned IP address being reused to configure a new computer on the network. Using DHCP servers can greatly decrease time spent to configuring and reconfiguring computers on your network. Servers can be configured to supply a full range of additional configuration values when assigning address leases. These values are assigned using DHCP options. Also, the DHCP lease renewal process helps assure that where client configurations need to be updated often (such as users with mobile or portable computers who change locations frequently), these changes can be made efficiently and automatically by clients communicating directly with DHCP servers. The following section covers issues that affect the use of the DHCP Server service with other services or network configurations. Using DNS servers with DHCP Using Routing and Remote Access servers with DHCP Multihomed DHCP servers. Describe the process of installing a DHCP server in an AD infrastructure? Open Windows Components Wizard. Under Components , scroll to and click Networking Services. Click Details . Under Subcomponents of Networking Services , click Dynamic Host Configuration Protocol (DHCP) and then click OK .
Click Next . If prompted, type the full path to the Windows Server 2003 distribution files, and then click Next. Required files are copied to your hard disk. How to authorize a DHCP server in Active Directory Open DHCP?
. On the Action menu, click Manage authorized servers.
. The Manage Authorized Servers dialog box appears. Click Authorize.
. When prompted, type the name or IP address of the DHCP server to be authorized, and then click OK.
DHCPInform is a DHCP message used by DHCP clients to obtain DHCP options. While PPP remote access clients do not use DHCP to obtain IP addresses for the remote access connection, Windows 2000 and Windows 98 remote access clients use the DHCPInform message to obtain DNS server IP addresses, WINS server IP addresses, and a DNS domain name. The DHCPInform message is sent after the IPCP negotiation is concluded. The DHCPInform message received by the remote access server is then forwarded to a DHCP server. The remote access server forwards DHCPInform messages only if it has been configured with the DHCP Relay Agent. Describe the integration between DHCP and DNS? Traditionally, DNS and DHCP servers have been configured and managed one at a time. Similarly, changing authorization rights for a particular user on a group of devices has meant visiting each one and making configuration changes. DHCP integration with DNS allows the aggregation of these tasks across devices, enabling a company's network services to scale in step with the growth of network users, devices, and policies, while reducing administrative operations and costs. This integration provides practical operational efficiencies that lower total cost of ownership. Creating a DHCP network automatically creates an associated DNS zone, for example, reducing the number of tasks required of network administrators. And integration of DNS and DHCP in the same database instance provides unmatched consistency between service and management views of IP address-centric network services data.